Improv Everywhere‘s book comes out today! 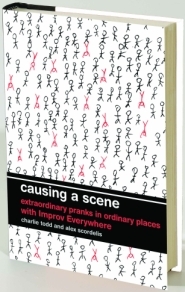 Causing a Scene, Extraordinary Pranks in Ordinary Places with Improv Everywhere is available in bookstores all over North America. The book comes out in Australia on May 28. You can also order it online at Amazon. 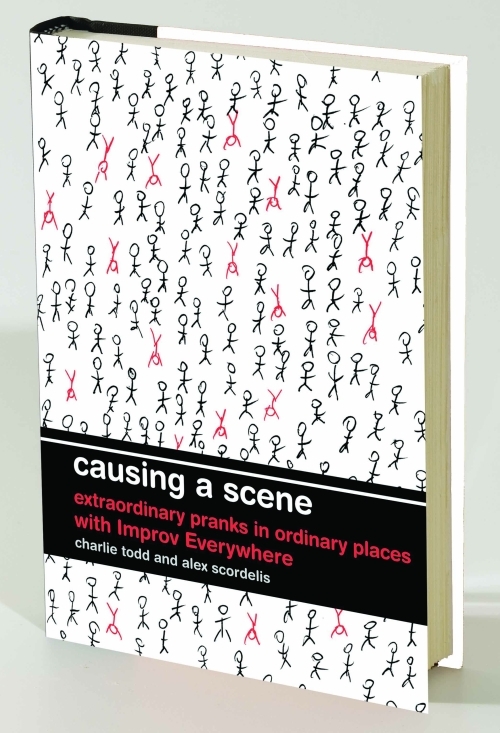 Causing a Scene is the behind-the-scenes story of Improv Everywhere, with an in-depth look at some of the group’s most successful pranks over the past eight years. It’s written by Improv Everywhere founder Charlie Todd and Improv Everywhere senior agent Alex Scordelis, and contains many awesome photos by Chad Nicholson. If you live in the New York City area, come by tomorrow (5/20) afternoon at 12:30 to the Bryant Park Word for Word writers series to watch Edward R. Murrow interview Charlie Todd about the book, and get your copy signed by the authors. Also for New Yorkers: Improv Everywhere’s newest Mp3 Experiment is Saturday! Check their site for details.